Swarovski, founded by Daniel Swarovski in the Austrian Alps, has been at the forefront of selling crystals for over 100 years. Daniel Swarovski founded the company in 1895 and since then has developed the business into producing goods with real quality. More specifically, some of these goods include a whole range of crystal collectibles that are desired by many across the world. So what exactly are these crystal collectibles? Collectibles are normally little ornaments that people like to own. They are usually kept in the home, though they are also kept at other places too. There are many different types of collectibles and these are sold in many different retailers across the high street and on the internet. Crystal collectibles are a particular type of collectibles and these are made by Swarovski. Swarovski crystal collectibles are very individual and very different. Each crystal collectible is designed around a particular object, animal or character. Some of the objects include a gift box made out of crystal with a bow tie on the top while others are crystallized key rings. The animal are particularly popular and there are hundreds of variations – some of the most memorable ones include a baby frog with its big gaping eyes looking up towards the sky, a rocking horse which is every girls dream, no matter how old they are, and a flamingo, perhaps for the more exotic consumer. Some of the crystallized characters include piglet, from the famous children’s classic Winnie the Pooh and Goofy, from the magical world of Euro Disney. There are many other stunning crystal collectibles too that Swarovski have engineered, however there are simply too many to name. Despite this however, Swarovski’s regular consumers are always in line to receive updates as to the latest collectible or ornament to hit the market. Swarovski’s crystal collectibles are sold in various places including H.Samuel who have a beautiful range. Products can be bought at any time but are extremely popular for noteworthy occasions including birthdays and anniversaries. Due to the beauty but maybe more so the cute factor, Swarovski crystal collectibles are also bought for Valentines Day and are received especially well. Buying a Swarovski crystal collectible is also a great thing to do as crystals are sometimes perceived as being magical. This however, is more a myth than anything else as Swarovski’s crystal collectibles are not quite the same as Mystic Meg’s crystal ball. That said, they certainly seem to keep people interested and entertained. Swarovski crystal collectibles are truly wonderful and will continue to be so well into the future. The author works for H.Samuel and Swarovski can be found at H.Samuel. For stunning Swarovski Crystal Collectibles visit H.Samuel. For more information on Swarovski visit Swarovski News. 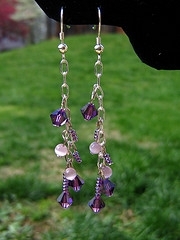 This entry was posted in Crystal Glitz and tagged beads, crafts, crystal, jewelry, swarovski on June 29, 2009 by admin.